The size of these humongous Alaska brown bear kills will really blow your mind. As you would expect from their name, the biggest Alaska brown bear kills in each major record book (Boone & Crockett, Pope & Young, and Safari Club International) were all hunted in coastal Alaska. While all of these bears are absolutely gigantic, we don't actually know for sure what any of them weighed because they were killed in remote areas far from a scale. While that information would certainly be interesting to know, the major conservation organizations don't use body weight to rank the biggest Alaska brown bears. Instead, they score bears by measuring the size of their clean, dry skull. To score a brown bear, you measure the length of the skull at its longest point, then measure the width of the skull at its widest point, and finally add the two measurements together for the total score. The Boone & Crockett and Pope & Young Clubs measure the size of the skull without the lower jaw, but Safari Club International measures the skull with the lower jaw. Though they are technically the same species as grizzly bears, Alaska brown bear live on or near the cost, where they grow to tremendous size due to their salmon and protein-rich diets. For this reason, they get much bigger than grizzly bears, which live inland and have diets without nearly as much protein. With this in mind, the major record books rank Alaska brown bears and grizzly bears separately. After spotting a huge brown bear taking an afternoon snooze, Jack and his guide stalked to within 35 yards of it without being spotted. The bear did not present them with a good shot at first, so they had to wait for several nerve wracking minutes hoping that the wind did not shift direction until Jack could get a good shot on the bear's vitals. That colossal bear is currently the biggest Alaska brown bear in the Pope & Young record book, and you can watch video of the whole hunt here. 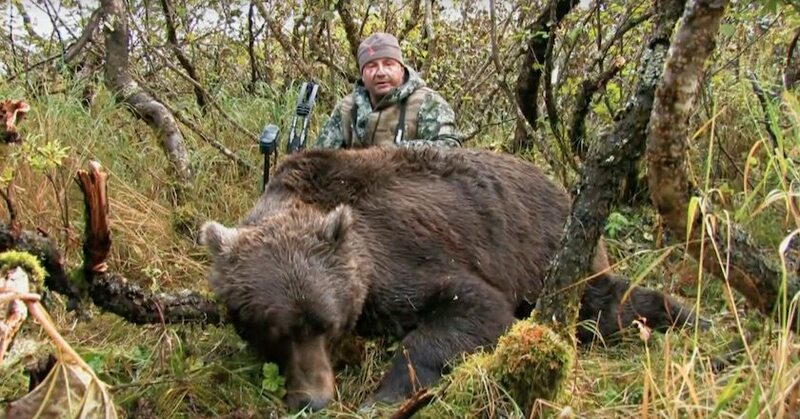 Kodiak Island has an well deserved, yet almost mythical reputation for producing massive brown bears, so it's not surprising that Roy Lindsley shot this gigantic world record bear there. An employee of the United States Fish & Wildlife Service at the time, Roy used his trusty old .30-06 Springfield rifle on his hunt back in 1952. Though I'm sure he knew it was a big bear, I doubt he realized just how big it was at the time. With a skull measuring 30 12/16", this enormous bruin has been the biggest Alaska brown bear in the Boone & Crockett record book for over six decades. Taken by Marvin Winter back in 1997, this massive bruin had a skull that measured 31 2/16", which makes it the largest Alaska brown bear in the SCI record book. Beyond that, we don't know too much about this bear and there aren't even any publicly-available photos of it. The photo displayed above shows the bear Gus Congemi took during an extreme close range encounter near Ugashik Lake that a television camera crew captured on video. That bear is the biggest Alaska brown bear killed with a bow in the SCI record book.